« Are you richer than a beggar? 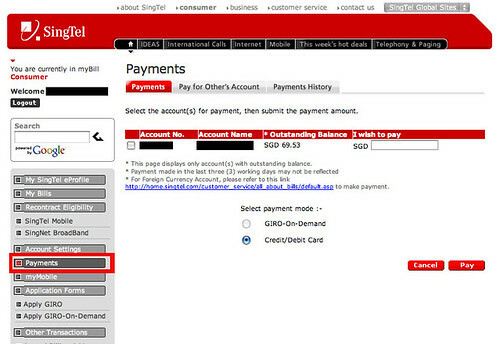 Step One: Sign up for a Singtel Mybill account. Signing up for this account allows you to check your Singtel statements online, change your address or other particulars, and even consolidate your various accounts into one so you only have one bill and one payment date to worry about! Step Two: Click on “payments” on the sidebar, follow the instructions, and viola! Pay your bill using your credit card. If you have a Citibank credit card, you can charge your Singtel bill to your credit card at any AXS Station. Just click on Citibank>Billpay, and follow the instructions. Signing up for Citibank One-Bill allows Singtel to charge your Singtel bill to your Citibank credit card when due. Using your credit card to pay your bills not only allows you to earn reward points or cash rebates, it also allows you to consolidate your payments, so you can pay off all your bills together when your pay cheque comes in each month, and you’ll never have a late charge again. A word of caution: Pay your bills using your credit card only if you pay off your credit card in full every month. If you pay merely the minimum, you’ll end up paying more than you owe! This entry was posted on Friday, March 27th, 2009 at 1:15 pm and is filed under Credit, Money Saving Tips, Singapore Watch ver 2.0. You can follow any responses to this entry through the RSS 2.0 feed. You can leave a response, or trackback from your own site. It?s really a great and useful piece of information. I?m satisfied that you shared this useful info with us. Please stay us up to date like this. Thanks for sharing. You really make it seem so easy along with your presentation but I find this matter to be really one thing that I feel I’d by no means understand. It seems too complicated and very huge for me. I’m having a look forward for your next submit, I’ll try to get the grasp of it! Just wish to say your article is as astonishing. The clarity in your submit is simply excellent and i could think you’re a professional on this subject. Well along with your permission let me to grab your feed to keep updated with drawing close post. Thank you a million and please keep up the gratifying work.